Africa in the News: "UN-Backed Polio Campaign to Reach 72 Million African Children"
Although the incidences of polio have dramatically increased in Africa, as in the rest of the world, since the discovery of its vaccine in 1952 the eradication of the disease is not complete. 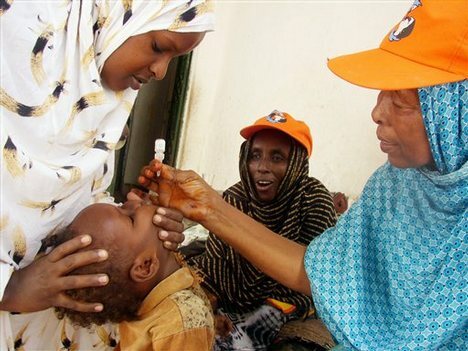 In 2009, the disease spread from Nigeria, the only African country to never have stopped polio transmission, across 24 countries highlighting the importance of complete eradication throughout the world. Now 15 African countries are engaging in what is hopefully the final push to rid the continent of the disease. The disease has no cure, can be fatal, but takes only two drops of an oral vaccine to prevent. The current $43 million UN backed effort will deploy 300,000 health workers in October and November with the goal to vaccinate 72 million children under 5 years old in high risk areas. The health workers will set up both fixed immunization posts and house to house vaccination teams travelling by car, foot, or boat to reach more remote areas. Just last week Nigeria, African’s epicenter of polio transmission, immunized almost 30 million children last week alone. Similar operations are taking place in Sudan, Burkina Faso, the Democratic Republic of the Congo, and Mali among 10 others. 1. What do you think are the principle reasons polio has been eradicated in the United States and not in Nigeria? What would change this reality? 2. What lessons could we learn from the successful cooperation of this initiative? 3. Why do you think it might be easier for governments, aid organizations, etc. to carry out this program than other health, development, or educational programs? 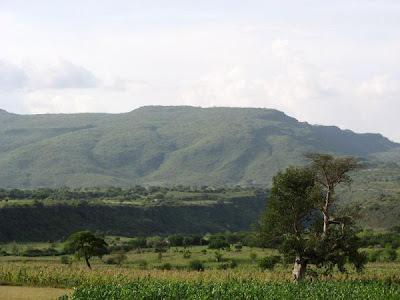 Addis Fortune (Addis Ababa): "First Ever Carbon Credit Trade"
The World Bank recently bought the Ethiopia’s first ever carbon credit for $34,000 from the Humbo Community Based Forest Management Project. The deal was introduced by World Vision Ethiopia to try to shift the communities surrounding the Humbo forest from cutting trees for subsistence to profiting from its preservation. The World Bank has pledged to invest $726,000 in carbon credits from the project in the next 10 years. This project is an example of one type of carbon trading and the “first large-scale forestry project in Africa to be registered by the United Nations (UN) under the Clean Development Mechanism of the Kyoto Protocol.” The idea behind this type of carbon trading is to offset the emissions from the developed world, by creating incentives to preserve forests which absorb carbon in the developing world. Currently these carbon credits are bought and sold voluntarily, as is the case for this project. The $34,000 spent by the World Bank will be divided between the 800 members of the project’s cooperatives. This is said allow the local communities to preserve the forest without financial burden to themselves. The money will also provide “100,000 cooking stoves” not only a humanitarian accomplishment, but also “could reduce carbon dioxide emissions by up to 60 percent.” The project is also supplementing income lost by cutting a portion of the trees in 10 years, selling the firewood and sharing the revenues, and also allowing new shoots to grow. As a result of this project, the Humbo forest is estimated to absorb 330,000 tons of carbon in the next ten years. Locally, the preservation of the forest will “recharge ground water; improve biodiversity; and reduce soil erosion, flooding, and drought.” The success of this project and others like it may be indicative of a growing trend in Africa to profit from preserving rather than extracting, and ultimately degrading, resources from the environment. 1. Do you think this arrangement is fair to the communities surrounding the Humbo forest? How might you be able to tell? 2. What role does Africa play in global climate change? What are some of the consequences of developing in an environmentally friendly way versus a more traditional way? 3. Do you think that carbon trading like this should be mandatory in some cases? In which ones? 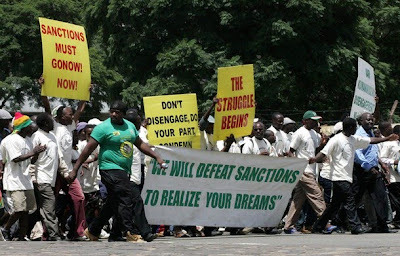 Africa in the News: "Zimbabwe: Mixed Reaction to Relax Sanctions Call"
Buisness Day (Johannesburg): "Mixed Reaction to Relax Sanctions Call"
Since 2002, Zimbabwe’s government and economy have been under a cloud of sanctions from European Union (EU) and United States (US) governments. These sanctions were imposed in response to alleged human rights abuses and election fraud by President Robert Mugabe and his regime. Since then, the EU has continuously renewed and increased the number of entities included in the sanctions every year. The United States has passed the Zimbabwe Democracy and Recovery Act which orders directors of financial institutions to “oppose and vote against any extension of any loan, credit or guarantee to the Zimbabwean government or any cancellation or reduction of debt.” While there doesn’t seem to be much public objection to the sanctions in the Europe or the US, officials from Zimbabwe’s neighbors, South Africa and Botswana, have called for their termination. Some officials of the EU government have expressed the potential for “a fresh look” at the sanctions dependent on further political developments. However, others have been more reserved, pointing out the necessity and nature of the sanctions. German Ambassador to Zimbabwe, Albrecht Conze opposes lifting the sanctions based on their specific nature which he says targets only a certain small group of people and cannot be considered a threat to the national economy. Others support the continuance of the sanctions as a matter of principle, justifying the sanctions based on Mugabe’s continued human rights abuses and political schemes which warranted the sanctions in the first place. 1. Do you think the sanctions only hurt targeted individuals or the general public in Zimbabwe? How might you be able to tell? 2. Do you think it is right to have sanctions on one portion of Zimbabwe’s unity government and not on the other? Do you think this inhibits the two party’s ability to work together? 3. Do you think the sanctions are accomplishing their intended effect? 4. Are sanctions an effective way to bring about change? Can you think of a course of action the international community could take to end human rights abuses and promote democracy in Zimbabwe that would be more effective? Africa in the News: "Sudan: Obama Issues Tough Conditions On Resumption of Relations"
The East African (Nairobi) "Obama Issues Tough Conditions On Resumption of Relations"
On the other hand, the Sudanese government has set forth conditions as well to “ensure a democratic and legitimate referendum,” including “the US to lift economic sanctions against Sudan, the US to remove Sudan from the list of countries sponsoring terrorism and for Washington to help influence the deferment of the ICC warrant of arrest against President al-Bashir.” Resuming diplomatic relations would have to take these conditions into account. The administration’s current policy toward Sudan of “constructive engagement” has angered many who find the actions of the Sudanese regime unpardonable. Others applaud the efforts as a positive change in U.S. strategy by being “pro-active and help prevent an outbreak of war rather than react later.” The position of the U.S. Government on the issue has consistently been that the referendum must be held peacefully, transparently, democratically and on time. We may have to wait until January to determine if the shift to engagement with the Sudanese government results in the fulfillment of this appeal. 1. Do you believe ‘constructive engagement’ will be effective in ensuring a peaceful referendum in Sudan? What do you think would be the best course of action? 2. Do you believe Sudan’s conditions will be met if the referendum goes on peacefully, democratically and on time? Do you believe they should be? What if offering them meant preventing a war? Africa in the News: "Could a Split Benefit Sudan?" The Guardian: Could a Split Benefit Sudan? In 2005, a 30 year civil war between forces in the Northern and Southern regions of Sudan concluded with the signing of the Comprehensive Peace Agreement (CPA). 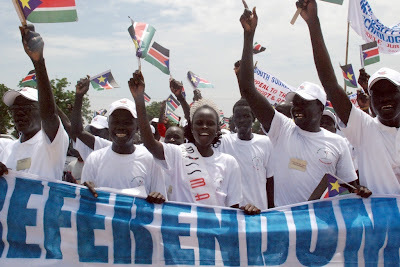 This agreement also set forth preliminary terms for a future referendum which would take place in January 2011 and would allow South Sudan the opportunity to become independent if approved. As the date for this referendum has drawn closer, preparations have been made to carry out the vote fairly, transparently and peacefully. 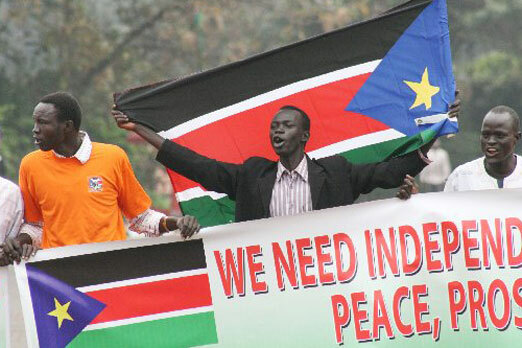 Anticipation has risen as it has becomes clearer that the Sudan will likely split into two independent nations. While there are still many contemptuous issues which have yet to be resolved the leadership of both regions have made clear their commitment to hold the referendum on time. The majority of coverage in the anticipation of the referendum has been full of fear and uncertainty. Secretary of State Hillary Clinton called the countdown to the referendum “a ticking time bomb of enormous consequence.” Southern Sudan’s President Salvia Kiir has requested and been granted UN peacekeeping troops to be deployed across ‘hotspots’ on the border. There has yet to be an agreement on who exactly will be eligible to vote, where the north/south border will be drawn, and how two independent countries would share oil revenues, access to the Nile or other resources. All of these issues have the possibility of sparking economic turmoil or war. Indeed there may be benefits for both the people of the northern region which have not been given enough recognition in the midst of so many negative reports. First, the region has long seen the oil rich region to the south as a major source of revenue and invested quite a bit into it. If the north is on its own, it will be forced to turn “its gaze inward” and “compelled to invest in itself and its people, to develop its infrastructure and resurrect a decimated civil society.” Although the northern government may be reluctant to lose a major source of revenue, the people of the north may see an influx of investment in their own communities. This is not to mention the cost savings of peace. Although there are many legitimate concerns, it is possible that “secession may be the beginning of a real and lasting change.” Of course many challenges lay ahead of both the northern and southern regions of Sudan. The challenges of carrying out the referendum must still be met and efforts to ensure that the procedure set forth in the CPA must be carried out. However, after the referendum, if the South does indeed become independent, both sides will have to confront reality without the other. Perhaps it may be more beneficial to hope for the positive opportunities change can bring than dwell on the negative. 1. Do you think the interests of the people and the interests of the government are the same in Northern Sudan? In the South? Where might their interests differ? How could you determine this? 2. Is there anything that the international community could/should do to accentuate the potential positives of a split for the north? 3. Can you think of any other potentially positive consequences of a split for both the northern and southern regions? 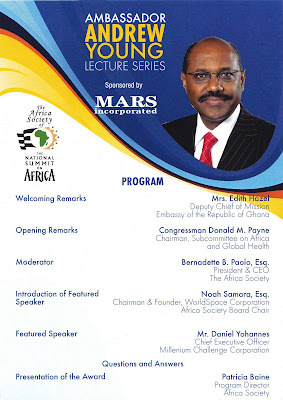 On Wednesday, October 6, 2010 at the Embassy of Ghana, The Africa Society of the National Summit on Africa held the 19th iteration of the Ambassador Andrew Young lecture series entitled “MCC’s Commitment to Africa,” featuring Daniel W. Yohannes, Chief Executive Officer of the Millennium Challenge Corporation (MCC). The speakers emphasized the importance to continue the effort to educate the American public, policy makers, and those in the Africanist community on Africa and U.S. policy towards the continent. Mr. Yohannes focused on President Obama’s policy plan towards Africa and the MCC’s place in fostering peace, security, good governance and development on the continent. Edith Hazel, the Deputy Chief of Mission at the Embassy of Ghana and host of the event, provided welcoming remarks while Bernadette Paolo, President and CEO of The Africa Society, served as the Mistress of Ceremony. Congressman Donald M. Payne, Chairman of the House Subcommittee on Africa and Global Health, provided remarks on the Africa Society, commenting on the change he has personally seen in the American public and policy makers on their perception of Africa through increased education provided by the organization. Noah Samara, CEO of WorldSpace and Africa Society board member, had the honor of introducing his fellow brother of Ethiopia, Daniel Yohannes. Mr. Yohannes began his remarks by commenting on the MCC and the Africa Society’s shared goal: “our commitment to helping Africans help themselves replace poverty with prosperity.” He went on to remind the audience of President’s Obama’s message, that Africa’s prosperity is not isolated, but rather tied to the prosperity of the United States. While the United States certainly plays a supporting role in Africa’s development, it is African governments themselves which must be responsible, accountable and “willing to do everything possible to create sustainable environments for growth that will open up opportunities for investment and trade.” Mr. Yohannes explained how the MCC’s performance based grants, which are awarded to countries with firm political, economic, and social policies aims to foster this type of culture in development and investment on the continent. Mr. Yohannes ended with a reminder that “the purpose of foreign assistance must be creating the conditions where it’s no longer needed,” where African trade, commerce and innovation are independent. The night ended with a rousing question and answer session, which brought to light many of the tough questions the MCC must face. After the lecture was drawn to a close, Mr. Yohannes was given enormous thanks and the audience lingered to enjoy a few more jovial moments among fellow friends of Africa. The world’s largest corporation, Wal-Mart, is in negotiations to move into Sub-Saharan Africa through a £2.9bn takeover of Massmart, a South African based chain of superstores. Massmart currently consists of 290 stores in 13 Africa countries such as Ghana, Nigeria, Tanzania and Zimbabwe under a variety of brand names. This deal is Wal-Mart’s first attempt to gain access to African markets which it deemed as a “’compelling’ growth opportunity.” Many within the region see Wal-Mart’s desire for business as a vote of confidence in their economies. However, the takeover may prove complicated for Wal-Mart, particularly in the case of Zimbabwe, as the U.S. is still enforcing targeted sanctions due to its disapproval of Robert Mugabe’s regime which has been accused of “ongoing human rights violations, land seizures and intimidation of political participants.” Things could also get complicated for the company within South Africa in the midst of ongoing strikes across industries for wage increases. Wal-Mart’s reputation ‘for being anti-union and for a ruthless approach in keeping down wages,” leads Michael Bride, deputy organizing director for global strategies at America’s UFCW union, to speculate that “The company may very well adopt a policy of racing to the bottom in terms of wages and salaries and then denying workers a voice." Opposition to the takeover has already been voiced by the Congress of South African Trade Unions. 1. 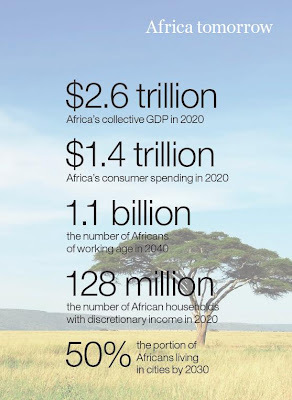 Do you believe this type of investment in African economies is positive? What might be some of the negative/positive side effects? 2. 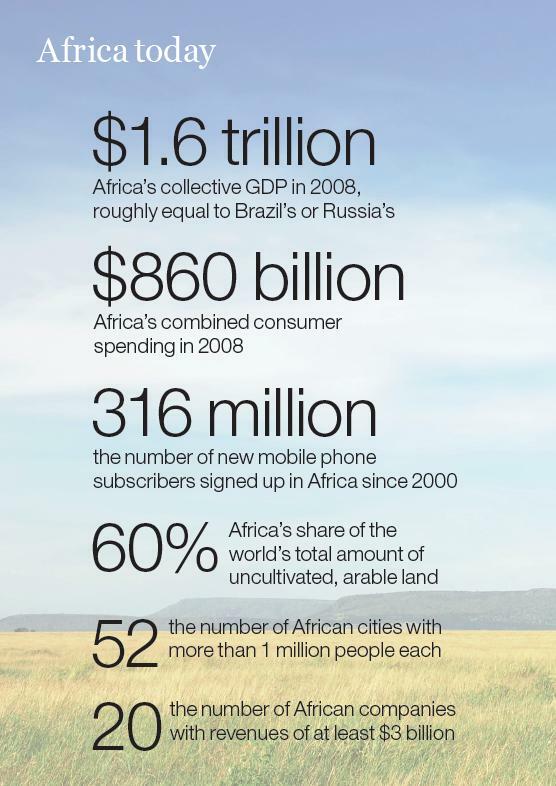 Do you think Wal-Mart’s desire to move into African markets is a good indicator of economic growth on the continent? 3. 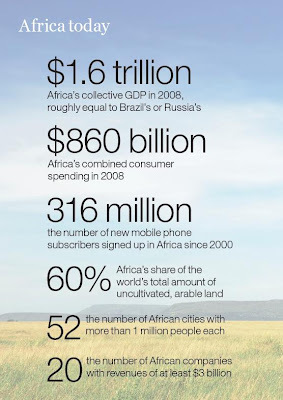 What may be some cultural implications of a large U.S. corporation entering Sub-Saharan African markets? 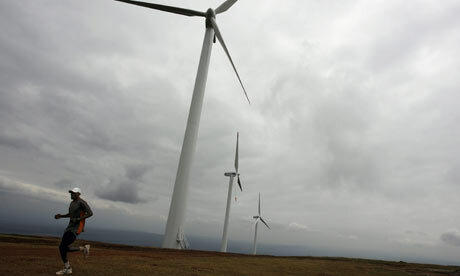 The Guardian: "Kenya to Build Africa’s Biggest Windfarm"
As Africa develops, so does an unprecedented demand for electricity. Many countries have struggled to meet the demand causing blackouts to be increasingly common. There has been substantial debate over Africa’s right, capability and responsibility to develop sustainable power generation over more traditional, less expensive, methods. In this climate of domestic and international pressure, to create more electricity that is both cheap and green, many African countries have turned to the wind. Although Kenya is not alone; many African countries are making strong moves to invest in wind power. Both Ethiopia and Tanzania have begun major plans to construct wind farms which will generate more than 10 and 15 percent of current electrical capacity respectively. South Africa has recently become the first African country to offer a “feed-in tariff for wind power” which incentivizes production by tendering cash for selling power to the national grid. However, there are considerable obstacles to providing electricity where is has never been available before, whether it is green energy or not. Less than one fifth of Kenyans currently have access to electricity, leaving huge gaps to fill in service delivery, many of these gaps existing in remote, rural, undeveloped areas. The transportation of turbines to their intended sites (as well as necessary improvements to roads and bridges to allow for transportation), the construction of transmission lines and substations, and similar infrastructure development all add huge costs to a green energy solution. 1. Should African countries develop energy sources as cheaply as possible, as quickly as possible or as sustainably as possible? Is it a zero sum choice? 2. If you lived or ran a business without electricity, would you want access to it as quickly as possible regardless of its source or do you think you would be willing to wait if you knew it would come from a renewable source? Would the price make a difference? 3. Do you think regulating the carbon credits of businesses in the US could help African economies? Should African businesses have the same standards as businesses in the US? Africa in the News: "
Committee to Protect Journalists: "‘A Somali journalist’s life is short anyways’"
Beyond the current conflict in Somalia between Islamist factions Al-Shabaab and Hizbul Islam and Somalia’s Transitional Federal Government, a violent and repressive struggle between the insurgents, the government and reporters over control of the country’s media has become a humanitarian crisis in itself. Reporter Tom Rhodes details the challenges of media entities within the country to report the truth, or much of anything at all, without the fear of violent repercussions. However, some journalists and news organizations are fighting back to provide the people of Somalia with up to date and unbiased information. Rhodes explains that four months ago, BBC operations in the country were forcibly halted, their property stolen and local media contracts cancelled by Al-Shabaab. Hizbul Islam also announced a ban on music to radio stations. These bans were headed by most, as the penalty for defying these “hard-line militant Islamist rebel groups” is often “death by crossfire and assassination.” However, the Shabelle Media Network, described as “one of Somalia’s leading independent broadcasters” broadcast their news and music despite the risks. The Network has paid dearly for their resistance, five of its journalists murdered since the conflict between insurgents and the Transitional Government began in 2006. The threat of violence on the media seems to be less immediate for the outlets working within the government controlled zones in Mogadishu, however, the fear insurgents hold over outlets and the self-censorship resulting from it are still strong. This is complicated by government threats to suspend radio stations in their controlled areas who comply with insurgent demands. Government authorities also censor information which may be contrary to their interests. Police have detained, interrogated and deleted the work of journalists and cameramen which did not fit the government’s proscribed narrative. Nevertheless, many journalists throughout Somalia have done no less than risk their lives to report on “one of the world’s worst humanitarian disasters.” Others have continued their cause by reporting outside of the country’s borders. 1. What opportunities are being held from the Somali people without media able to report freely? 2. Who do you think the reporters in Somalia could turn to for help? 3. What actions do you think the people of Somalia could take to restore media freedom? What actions could the US government/people take? 4. How much do you rely on the media for information about your community, country, the world? Do you believe these outlets could be biased? Does this make a difference? What could you do to make sure you are getting truthful information?